For our young children, we do not teach them about “fighting”. Rather, we strive to give these students the skills that, as they develop, turn into the same skills used to defend themselves should they ever need to do so. 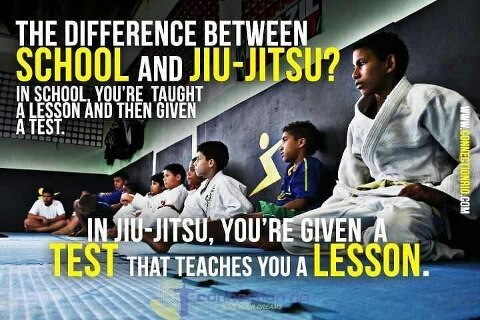 We teach the fundamental techniques and body mechanics necessary for proper Brazilian Jiu-Jitsu and Judo via different games and activities that keep the children engaged and interested. Further, we work to instill confidence and discipline in our young students, giving them the tools to address bullying and to succeed in the classroom and in other arenas. We do all this while also using stressing the value of health and wellness. We seek to develop the children’s strength, agility, and balance while they have fun! We follow the Kids Belt System as put forth by the International Brazilian Jiu-Jitsu Federation. Children under the age of 16 follow a different belt system than the adults, because adult belts represent a level of competence that a child is unable to achieve due to their physical, and mental immaturity. Children follow a belt system that rewards attendance and positive attitudes during class. There are far more belts for children than for adults so that the belts can be used for motivation, and to reward a positive attitude. We have 13 children’s belts. White belt is the beginner’s belt. 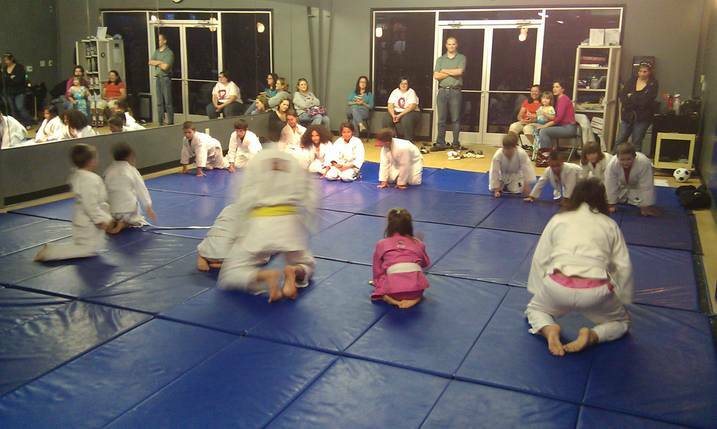 The normal time spent at white belt will be 6 months if the child averages twice a week. After 1 year of training at Green/Black and reaching the minimum age of 16 (year of birth), the kid now enters the adult belt system. *Promotions are conducted four times per year. We have been told for years that fighting is morally and ethically wrong. That it is never the answer. This belief has threatened our country’s security and now we see the effects it can have on our children. Fighting is not wrong in the cause of self defense. It is not wrong for our nation to proactively protect itself nor is it wrong on a personal level to respond with physical force when threatened. When I was young and in school a little boy hit me in front of the teacher. He was reprimanded and sent to detention. On the way out of school he told me he was going to do it again the next day. When I told my parents about the incident, they told me if he tried to hit me again, I was to hit him. Actually, they said hit him hard enough that he will never want to hit you again. I did and he didn’t. A couple of years ago my wife went to pick up one of our boys at preschool. She found him hiding under a desk. When she asked him why he was hiding he said he was hiding from one of the other boys who had choked him several times that day. When my wife approached the teacher she was told that the boy “was having trouble at home and just acting out.” While I sympathize with the child who was having trouble at home, this was somehow supposed to excuse him attacking my son. That night we taught our son a simple Krav Maga self defense technique. He in turn shared his new knowledge with his teacher. His teacher made it very clear to him that under no circumstances was he to defend himself. He was to get her attention instead ( with a child’s hands wrapped around his throat) and she would take care of the problem. We of course relieved him of that notion. Think of the different lessons these two stories teach. In the first, my parents taught me not only that I had a right to defend myself but that the responsibility for my safety rested with me. In the second, the opposite lesson was taught. My son was told his safety was someone else’s responsibility and under no circumstances was he to defend himself. If you have been taught the first lesson, you react instantly to someone threatening your safety. If you have learned the second, you look for an authority figure to help you when threatened. If there is no authority figure to stop the attack you waste valuable time deciding what to do and how to react. We are complicit in the victimization of children by predators if we are teaching children to look for an elusive authority figure for help. A few months ago, we watched in shock, the video of poor Carly Bruscha simply allowing someone she doesn’t know to walk up, grab her arm and pull her away. She looks confused and frightened on the video. It takes only an instant for her abductor to move her out of the cameras eye. What a different video we might be seeing if at the instant she was touched by the man she launched into him biting, kicking and using everything she had to keep him away from her. I heard a retired FBI agent say, that they knew of no case where a child who was fighting back was killed in the course of an abduction. The reverse is not true. If abducted the outcome is almost universally bad. “evidence the little girl fought her attacker to the end.” The problem is she didn’t fight in the beginning. fight. Yes, they ALSO need to be taught good judgment so they know when fighting might be wrong. How much is 10yr class and what days? Hey Tiffany. Message me or call me at 270-234-3961 for more info. What is the class schedule for children at Bowling Green location? 11 and 14 year olds. Price? Hello Tim. Youth classes in Bowling Green meet on Tuesdays and Thursdays from 6-6:45pm. The cost is 100 dollars a month and the uniforms are provided. World silver medallist Shannon Montgomery is the head instructor. The classes are held at House of Fitness. 513 State Street. Hi what would be the cost and days for Elizabethtown and where are the classes held for a 5 year old girl? Thanks!